Since 2002, Katy O’Grady and D & O Creative Group have provided ghostwriting, corporate and feature writing, editing, and communications services to clients in the Washington, DC, area and across the United States. Katy works with authors on technology, education, and mental health topics. She also helps associations and small business leaders deliver their messages with clarity and power. The core of D & O Creative Group’s services is the writing partnership. Katy works closely with each client author to craft the best possible text in their style and voice. Her writing partnership authors have been published by CRC Press/Taylor & Francis, AMACOM, and the American School Counselor Association. Katy O’Grady is a graduate of the College of Wooster and worked in association and non-profit marketing and communications prior to co-founding D & O Creative Group. 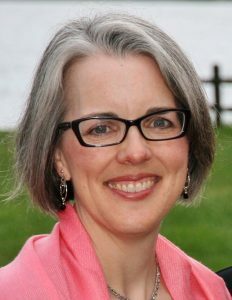 She lives in Fairfax, Virginia, with her husband, son, and two retired racing greyhounds. A lifelong choral singer, Katy is currently working on a book about singing and community. Katy O’Grady took an idea, mentored the editor-in-chief, and managed a gaggle of geeks who are better at code than grammar. The result is a book that is a standard in the Oracle Enterprise Performance Management community. Her diligent work and expert advice also managed to prevent the editor-in-chief from losing what little mind he has left. Simply put, “Developing Essbase Applications: Hybrid Techniques and Practices” wouldn’t exist except for her. I recommend Katy to any and all. Professional, talented, and trustworthy are three ways I would describe Katy O’Grady. I have worked with Katy since 2011 on numerous projects large and small, and she is an outstanding editor and writer. For my two most recent books, her in-depth editing brought out my core messages and she added valuable research and perspective to the process. Katy has helped me produce regular blog posts and newsletters, writing some based on my book chapters and editing others that I drafted. I also rely on her to edit materials for my business and my clients, including proposals and critical project deliverables. Always thorough and responsive, Katy is easy to work with. I strongly recommend Katy as an editor and writer. Her professionalism and support have been invaluable to me. Over the past several years, Katy has produced several volumes of technical writing for us at InfoZen. She has shown an incredible amount of flexibility in taking assignments as diverse as writing technical user manuals, writing requirements documents or marketing documentation. At times, she has provided the editing services we needed; often she has done the entire writing herself. Katy is always a pleasure to work with as she provides her services with quality and timeliness. I can, without hesitation, strongly recommend Katy to anyone who has writing or editing needs. In addition to giving us great results, expert knowledge, and good value, Katy is personable, punctual, and reliable, and she’s creative in her approaches to the articles she has written for us. In reviewing some of our scholarly manuscripts, Katy has made them more readable and included thoughtful author queries.